Now rain can come all thanks to this Dora Raincoat And Umbrella. When it rains an umbrella is great but a raincoat often works way better and when you combine both then you are all set. 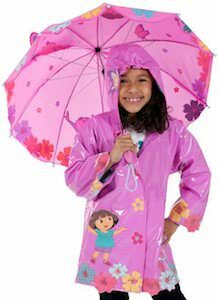 This rain wear you can get in toddler and small kids sizes and both are pink with on it flowers and images of Dora The Explorer and even Boots shows up and some butterflies of which one tries to fly away as it sticks out of the umbrella. I am sure that your child is going to be waiting for rain so that they can test if they get wet or not. If you want a fun t-shirt for Easter then Dora the Explorer has you covered. This Dora t-shirt is available in styles for kids and adults and comes in many colors and styles. On the Dora t-shirt, you can see Dora The Explorer sitting on the ground with her backpack on her back and holding an easter egg and in front of her stands a big basket of colored Easter eggs. A t-shirt like this is just perfect for an Easter egg hunt and other activities on Easter. 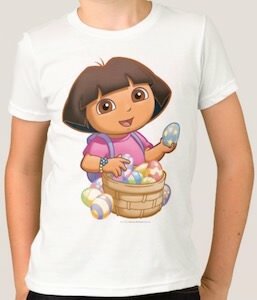 Show the world that you love Easter eggs and Dora by wearing this cute t-shirt. A Dora themed birthday party of course needs special invitations because without it your friends don’t know that there is a cool party coming up. Now there is this set of 8 Dora the Explorer party invitations and envelops so just write the details in it and the address on the envelop and your party is a go. Of course on this invitation card you can see Dora waving at you and some pretty flowers and in the corner it says “You’re Invited” so that people even know that a party is coming up without opening the Dora card. Do your kids drive you a little crazy sometimes from being hyper all the time? 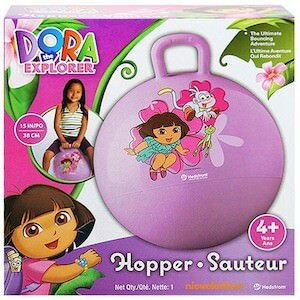 Well, let them have fun and burn all of that energy off on one of these cool Dora the Explore space hopper balls. This cool Dora the Explore hopper ball is pink in color and has a picture of Dora, her monkey friend boots, a cute little frog all looking like there hopping around with pretty flowers behind them. The space bouncy ball measures 15 inches (38 cm) suitable for ages 4 and up. Sun sand beach and pool are all ready to have you come for a swim and when you bring this Dora kick board then things will be extra fun. 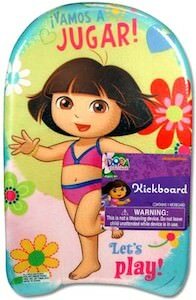 This kickboard shows flowers and of course Dora the Explorer and she is ready to swim she already wears her bathing suit. At about 16″ long this kickboard is the perfect size for kids. And when Dora is around swimming becomes even more fun. And it doesn’t matter if you want to take the Dora kickboard in to the shallow end or the deep end just make sure you can swim and then you can play with this fun pool item. You just have to check out this Dora The Explorer Kickboard. All little kids loves Dore The Explorer. 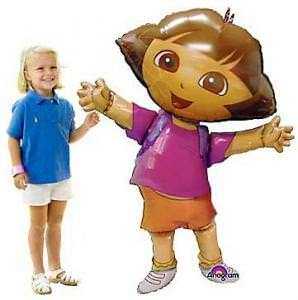 Planning a fun Dora birthday for your little ones party? Well these Dora flowers adventure cups will be the perfect addition to your party planning. There is a cute picture of pink and purple flowers featuring Dora and her best friend Boots going on one of her adventures. 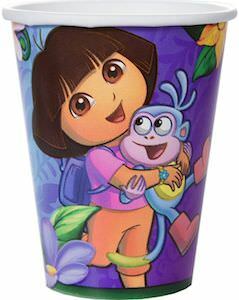 These Dora The Explorer paper cups come in a set of 8 cups and holds nine ounces of your kids favorite beverage. 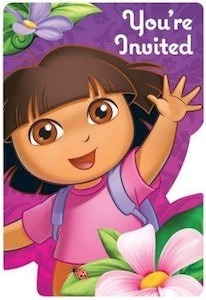 Make your party games adventurous like Dora does for all the kids at the party. Kids will have so much fun at this Dora theme party with these special looking Dora The Explorer Paper Party Cups. A day on the beach of just fun in the garden all needs a fun chair. If your kids like Dora and Boots then this lounge chair is perfect. The chair has a pink frame with on the chair covers with Dora and Boots and lots of hearts. 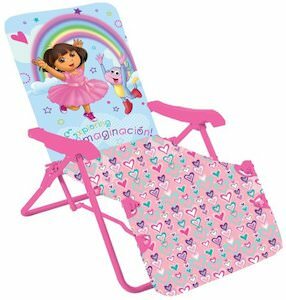 And this Dora the Explorer chair can be folded easily for storage and to make it easier to take to the beach, pool or any where else you need a chair. This Dora chair has multi position back and footrest so that kids can be super comfortable. 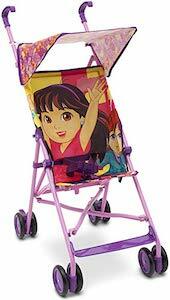 Kids with a weight till up to 60 lbs (27kg) can enjoy this fun Dora kids chair. If you kids love Dora the Explorer and the bath then this bath mitt is gone be a hit. This bath mitt is shaped like Dora complete with flower in her hair and everything. Kids are gone love it when they are washed by their favorite character Dora the Explorer. 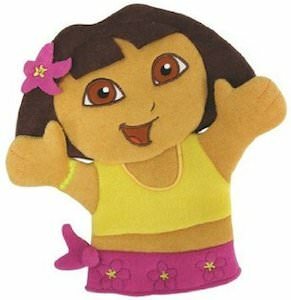 And to make the bath time even more fun you can play with it like it is a Dora puppet. On the inside of the bath mitt there is a hanging loop so that you can hang it to dry after bath time. If you are planning the Dora the Explorer birthday party then you are gone have to look at these super cute paper plates. 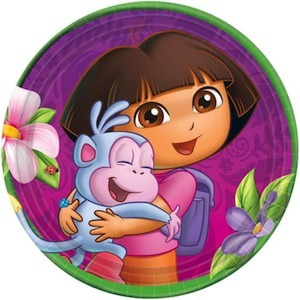 On these plates you can see Dora and her monkey friend Boots in a happy hug. These round plates have a diameter of 7 inch making them plenty big for cake and snacks. And these Dora paper plates come 8 in a pack so that you will be all set for your party. With Dora and her friend Boots ready to party the kids are gone party to and if the kids are happy the parents will be to.